Getting Medical Test Results Faster…Patients who have medical imaging tests done would get their results faster, especially if follow-up care is needed, under legislation which passed the House recently. House Bill 1884 would require that results which are provided to a health care practitioner after certain diagnostic imaging services are performed on a patient be sent directly to the patient or designee within 20 days if the results include a significant abnormality. The clock starts when the results are sent to the patient’s ordering physician. The test results may be sent electronically by email or fax or added to the patient’s electronic medical record. Test results belong to the patient, and by law, are provided upon request. Providing patients with the summary of test results when an abnormality is found will enable patients to be proactive in their health care, and provide a safety net in the event of communication breakdown. The bill now moves to the state Senate for approval. I will be hosting a Fish and Boat Commission Seminar on Thursday, March 1, from 6-8 p.m. in the board room at the Derry Township Municipal Building. Representatives from the Pennsylvania Fish and Boat Commission will discuss a number of topics to get local anglers and boaters ready for the upcoming fishing and boating seasons. This is a free seminar and boating or fishing licenses are not required for this event. Seating is limited and advance registration is required. You can register by calling my Hershey office at (717) 534-1323, by Feb. 23. For more information visit RepMehaffie.com or Facebook.com/RepMehaffie. Protecting Your Personal Information from Tax Identity Thieves… According to the Federal Trade Commission, tax refund fraud is the largest and fastest-growing identity theft category. Tax identity theft occurs when someone steals a person’s personal information, often obtained through old tax returns, and uses it to file current fraudulent tax returns in someone else’s name to receive a tax refund. Taxpayers in their 20s are at the highest risk for tax identity theft victimization; however, anyone at any age can be targeted. The best way to safeguard a person’s identity is to properly dispose of any documents that contain personal and identifying information by shredding bank and credit card statements, as well as old tax returns. Individuals should use firewall and anti-virus software on devices, create strong passwords on websites, and refrain from opening emails from unknown senders. In addition to using stolen information to get a tax refund, thieves may also use stolen Social Security numbers to get a job. If you receive a letter from the IRS saying more than one tax return was filed in your name, or IRS records show you have wages from an employer you don’t know, then you may be the victim of tax identity theft. Also, if you suspect a letter, email or telephone call about your tax records is a scam, call the Pennsylvania Department of Revenue at 717-787-8201 or the IRS at 800-829-1040. 2017 Property Tax/Rent Rebate Forms Now Available…Forms for the state’s 2017 Property Tax/Rent Rebate program are now available for download from the Department of Revenue’s website. Paper copies of the forms are available from my district office or municipal offices and libraries throughout the 106th District. Eligible participants can receive a rebate of up to $650 based on their rent or property taxes paid in 2017. The program benefits eligible Pennsylvanians who are 65 years or older, widows and widowers 50 years or older, and those 18 years or older with disabilities. The income limit is $35,000 a year for homeowners and $15,000 annually for renters, and half of Social Security income is excluded. Applicants should be prepared to provide all the necessary income, property tax or rental information required to process claims quickly and accurately. Applications are due by June 30. For more information, visit my website at RepMehaffie.com. Winter Weather Causing Early Pothole Outbreak…PennDOT reminds motorists they can report potholes and other roadway concerns on state roads by calling 1-800-FIX-ROAD or visiting www.penndot.gov and clicking on “Submit Roadway Feedback.” The agency reported that extreme fluctuations in temperatures, coupled with an active snow season, are causing an early outbreak of potholes. A pothole develops when water seeps below the road through small cracks in the pavement surface. As the water repeatedly freezes and thaws due to temperature fluctuations, a cavity forms below the surface and larger cracks develop, which destroys the strength of the pavement. When reporting a pothole, be as specific as possible as to pothole locations or other maintenance concerns such as deer removal or signing issues. Again, for state routes, report the county, municipality, street name and route number, or the state route (SR) number that can be found on small black and white signs posted along state roadways. Also provide a description of any familiar landmarks that will help PennDOT locate the problem area. 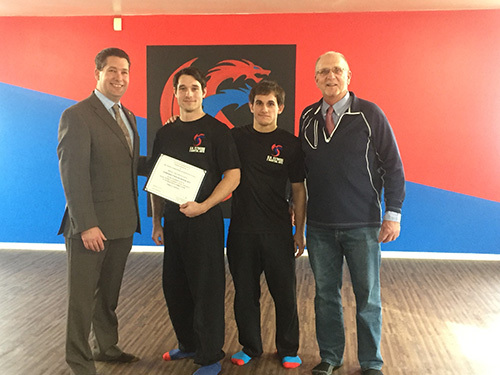 Recently, I joined Mayor David Roeting in welcoming Super Human Fitness and Martial Arts to its new home on 2nd Street in Hummelstown. The school offers programs in martial arts, personal training, self-defense and Brazilian Jiu Jitsu. Owners David Schmuck and Luke Grumbine are very impressive young men. Owning your own business isn't easy, but these men have the drive and stamina to be successful. The ribbon-cutting ceremony was on Jan. 20, and I stopped by to present a congratulatory certificate. It was the first time I've ever given a certificate presentation in my socks! The Lower Dauphin High School Boys Soccer State Champs were honored in the House of Representatives on Jan. 23. The team received House of Representatives citations and recognition during session for capturing its second consecutive state title on Nov. 18 in a 4-to-1 victory over Northwestern Lehigh High School. Way to go, Falcons! Many residents and local officials turned out on Jan. 19, to see the ribbon cut on the 106th District's newest firearm and archery range, 717 Armory. 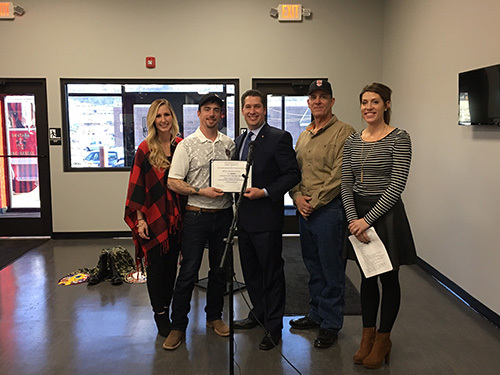 I presented owner and CEO Patrick Connaghan and his family with a certificate welcoming them to the 106th District. I thanked Patrick for his service to our country as he is a U.S. Marine Corps veteran. 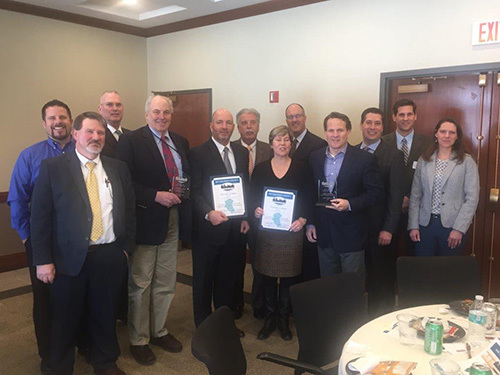 Congratulations to Derry Township for receiving two Dauphin County Premier Project Awards. The first award, Growing Our Economy, was presented to Derry Township for the Park Boulevard relocation project. The second award was a Small Project Award for the 2017 zoning ordinance.